ABOVE: The Vasa was raised from Stockholm Harbor in 1961, 333 years after her ill-fated maiden voyage in 1628. The Vasamuseet in Stockholm is one of Sweden's major tourist attractions, and with good reason: The museum houses the Vasa, a wooden warship that sank in Stockholm Harbor during her maiden voyage in 1628. The Vasa was built during the 30 Years' War of 1618-1648, when Sweden had lost a dozen ships and needed vessels to support King Gustav II Adolph's military campaign in the Baltic. 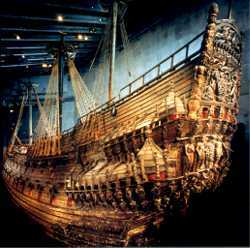 The ship was the largest in the history of the Swedish fleet, with an extra cannon deck that the king himself had ordered during the Vasa's construction. On August 10, 1628, the vessel departed from her mooring in front of the royal palace with some 130 crewmen and wives on board. As she sailed slowly through the islands that separate Stockholm from the open sea, a wind caught the sails, and the top-heavy ship unexpectedly hove to port. Water poured through the open cannon ports, and the ship sank in the 105-foot (32-meter) channel. Although most of the crew and passengers escaped, some (including the ship's cat) went down with the Vasa. Sporadic salvage attempts took place over the next 50 years, but the ship was all but forgotten by the end of the 18th Century. Photo courtesy of Hans Hammarski�ld and the Vasa Museum.